Whatever you do, don't try to sell your printing business or make an offer to buy another firm until you've read this book. Whether you're planning on selling in the next six months or considering the purchase of a competitor, this brand new 310-page book is packed with information on how to arrive at a "fair market" price for the business - a price on which both you and a prospective seller or buyer can agree. What happens when there are no "Excess Earnings?" What about a business with a negative "net worth?" Take the samples we provide, insert your own numbers as required, follow the steps we outline, and you'll have your own valuation in a matter of minutes. 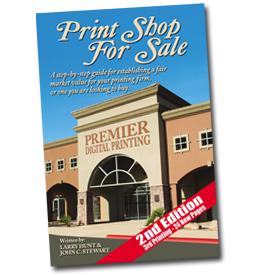 Also included included in Print Shop For Sale is a 100-page Appendix containing actual valuations for companies with annual sales ranging between $250,000 and $5 million. The unique valuation tables use a "quick lookup" approach and provide an estimated "fair market" based upon a number of variables, including sales volume, net assets, owner's compensation and a range of excess earnings multipliers.